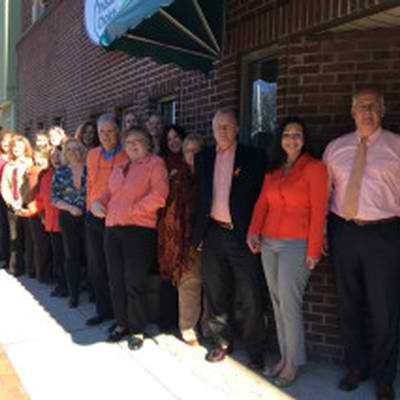 Recently the TRACY-DRISCOLL Team dressed up in orange to raise awareness for those diagnosed with COPD.Â There are 15 million Americans who have been diagnosed with COPD with another estimated 12 million who may have COPD that hasn’t been diagnosed. When you breathe, air travels through tubes in your lungs’called airways’to millions of tiny air sacs. In a healthy lung, the airways are open and the air sacs fill up with air. Then the air goes quickly out. COPD makes it hard to get air through the airways and into and out of the air sacs. “Chronic bronchitis” is increased cough and mucus production caused by inflammation of the airways. Bronchitis is considered chronic (or long-term) if a person coughs and produces excess mucus most days during three months in a year, for two years in a row. “Emphysema” is associated with damage of the air sacs and/or collapse of the smallest breathing tubes in the lungs. Stage 1:Â very mild COPD with a FEV1 about 80 percent or more of normal. Stage 2: moderate COPD with a FEV1 between 50 and 80 percent of normal. Stage 3: severe emphysema, with FEV1 between 30 and 50 percent of normal. Stage 4:Â very severe COPD, with aÂ lower FEV1 than Stage 3 or those with Stage 3 FEV1 and low blood oxygen levels.